Pierwsza restauracja North Fish w Elblągu i początek rebrandingu! | North Food Polska S.A.
On 28 March, a new North Fish restaurant opened in Elbląg, at the Ogrody shopping centre. 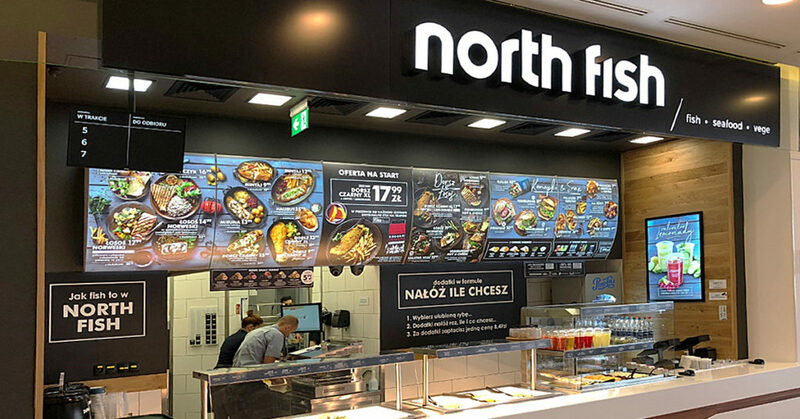 This is our 41st location in Poland, but it stands out thanks to the new North Fish logo which adorns it. The opening of this branch kicks of the long-awaited rebranding process. Over the coming weeks, more restaurants will see their logos changed. The new North Fish in Elbląg offers, as always, a rich selection of fish and seafood prepared from scratch every day. The menu also includes delicious sandwiches with bread baked in-house, snax, soups, fresh smoothies and lemonades from natural ingredients, and other products already well known from our chain. A special promotion has been prepared for the opening, which will last until 8 April. The new restaurant is located on level +1.